Much had been expected from the Williams-Renault FW13B when it first appeared in the 1990 F1 World Championship, this ‘B-Spec’ featured aerodynamic and rear suspension advances, plus Renault’s more powerful RS2 V10 power unit. FW13-B followed on from the Williams-Renault FW13 designed by Enrique Scalabroni – working under Patrick Head’s direction, which Thierry Boutsen drove to victory in the Australian GP in 1989 with Patrese in third. FW13 was created specifically around the innovative 67° V10-cylinder 3.5-litre Renault RS1 racing engine, mated to a transverse Williams/Hewland six-speed transmission, and featured double wishbone suspension front and rear. The new car also featured a moulded carbon/Kevlar composite monocoque chassis with small sidepods, lowline nose and a flattened oval engine airbox intake. With three Grand Prix successes to its credit the FW13/13B was a noteworthy member of the Williams family in its heyday with chassis FW13B-08 featuring as one of the most significant cars in the FW13 production run as a Grand Prix winner. Since it’s retirement in 1990 Chassis FW13B-08 has been retained as part of the Williams Private Collection that was until last year, when it underwent a full restoration and race preparation by Williams in order for it to run at the 2015 Goodwood Festival of Speed at the hands of current Williams Martini Racing driver, Felipe Massa. This car is now offered for sale through Official Williams Heritage Agents Cars International, offering a unique opportunity for someone to claim first ownership after Williams Grand Prix Engineering and become the new custodian of this Grand Prix legend. FW13B-08 had been Thierry Boutsen’s favourite chassis and the Belgian raced it 14 times in 1990. 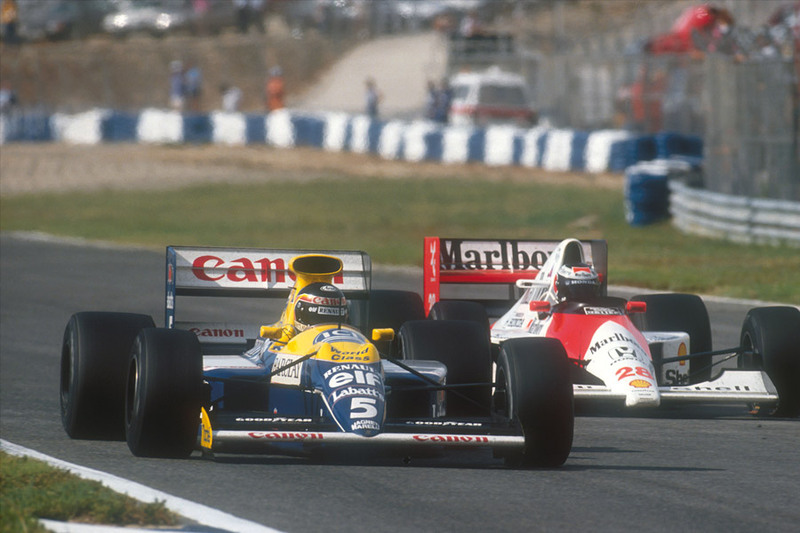 However, he failed to finish the San Marino Grand Prix, which opened the European season, after running a strong second to Senna, it was driver error which left team-mate Patrese to take the chequered flag. Boutsen delivered a string of high positions after finishing fourth in Monaco and fifth in Mexico. The British Grand Prix at Silverstone then brought him home second to Prost from fourth on the grid, before Germany yielded a sixth place. The big day finally came at the Hungaroring on August 12th. The FW13Bs were very well suited to the tight track, and Boutsen started from the first pole position of his F1 career with Patrese alongside “Changes to the engine management system made things a lot better,” he said. “Even so, I think I could have gone quicker.” The McLarens of Berger and Senna were on the second row, unable to break 1m 18s. Boutsen took an immediate lead and in the race of his life held off challenges from Berger, then Patrese, and later Alessandro Nannini until the Italian’s Benetton was aggressively punted out of the way by Senna at the chicane on the 64th lap. Senna on fresher tyres, kept up the pressure right to the flag. He made one real attempt to pass going into Turn One on the 75th lap, but the Belgian had that covered and retained his calm control of the race to take FW13B-08 to a well deserved victory two laps later. After he and Senna had crossed the line the McLaren driver pulled alongside and gave him a signal of appreciation of a job very well done.